Far from the eyes of Annapolis, Baltimore, Rockville and Upper Marlboro, the GOP is steadily expanding its grip on county governments in Maryland. In fact, the Republicans hold majorities of almost all categories of powerful county officials. Let’s start with County Executives (including the Mayor of Baltimore). 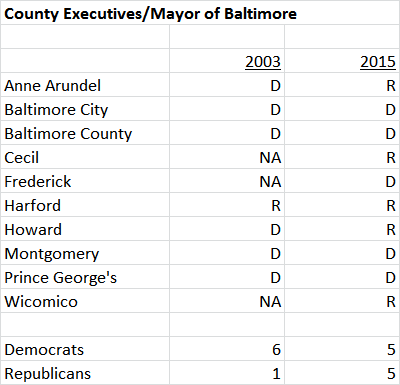 In 2003, six counties plus the City of Baltimore had executive positions. Only Harford County had a Republican Executive. By 2015, three more counties (Wicomico, Cecil and Frederick) had executive positions. The Democrats and Republicans are now tied at 5-5. Anne Arundel and Howard, both strategically critical suburban counties, have flipped from Democratic to Republican. The current Republican Executive of Wicomico defeated an incumbent Democrat to claim the seat. Republicans are a threat to claim the Executive seat in Frederick if they run someone other than Blaine Young, and that would give them a majority for this office. 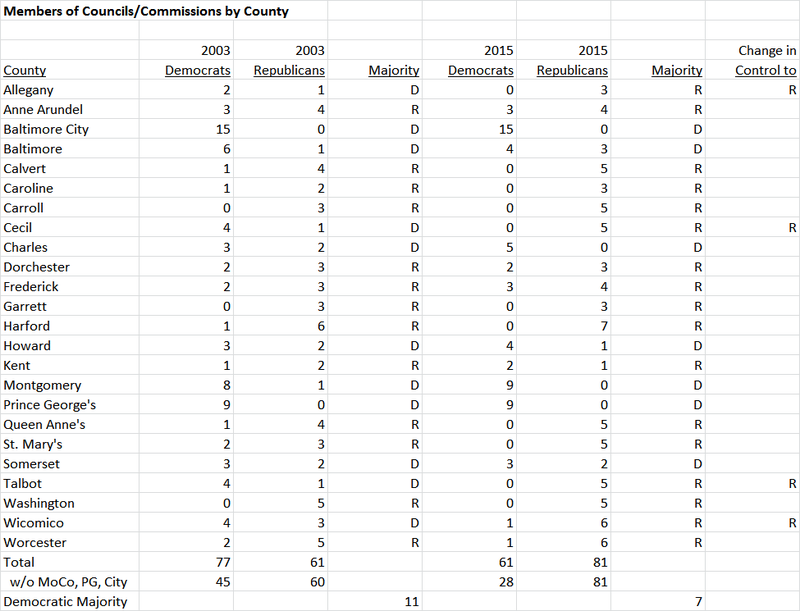 Now let’s examine County Councils and Commissions. In 2003, the Democrats had local legislative majorities in 11 of 24 counties. By 2015, the Democrats had majorities in 7 counties as Allegany, Cecil, Talbot and Wicomico had flipped to GOP control. In 2003, Democratic local legislators outnumbered Republicans by 77-61. In 2015, the Republicans had an 81-61 lead. Omitting the Big Three Democratic strongholds of the City, Montgomery and Prince George’s, the GOP’s edge increased from 60-45 to 81-28. The Maryland Association of Counties (MACo) is effectively Republican-held territory. Here are the splits for State’s Attorneys and Sheriffs. Democrats went from having 13 State’s Attorneys in 2003 to 8 now. 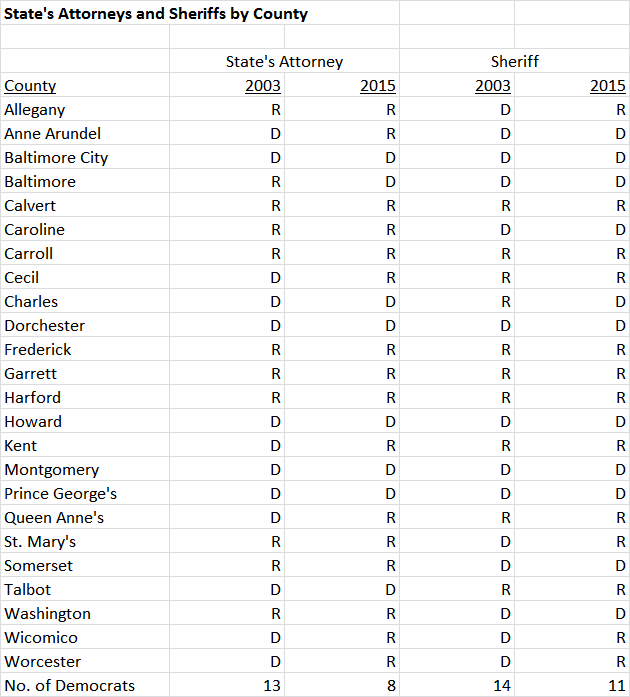 Among Sheriffs, Democrats went from 14 to 11. Democratic majorities turned to Republican majorities in both offices. We’ll have some thoughts about what this means in Part Four. Previous PostThe GOP Bench, Part IINext PostWho Supports the Senate’s Tax Cut for the Wealthy? Bueller? Bueller?